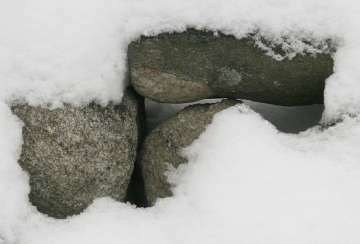 Snow on stones in a stone wall makes a portrait of January in Westborough. One sign of life is the small round patch of lichen growing on the top stone. When spring comes, the stone wall will be habitat and hiding place for wildlife such as chipmunks, mice, and snakes. Here we are in January again – a time when most of us turn into couch potatoes (when we’re not out shoveling snow). But think of nature and the delights it offers us throughout the year! To give your memory a little jog, take our annual Nature Notes quiz. Below you'll find short descriptions of plants, animals, or other natural things featured in Nature Notes in 2010. Match these descriptions with names in the list of possible answers that follows. Choose your answers from the drop down lists. Check your answers by clicking the "Show Answers" button. The answer page will contain links to the 2010 columns about the plants and animals so you can read them again if you wish. If all – or almost all – of your answers are correct, email your name or your group’s name to us at NatureNotes@westboroughlandtrust.org. We'll congratulate the top scorers in a future issue of the Westborough News – the more top scorers, the better. 1. Groundhog is another name for this native animal which, according to lore, peeks out of its winter burrow on February 2 to predict the early arrival of spring (or not). 2. A strange, unearthly wail is the song of this small nocturnal bird of prey. 3. Surprisingly, this familiar inhabitant of the soil is non-native. 4. This early-blooming wildflower looks very much like a dandelion. 5. This creature’s trills make the wetlands hum in late April. 6. These two lovely creatures are among those that migrate northward in the spring. 7. This grassland bird flies all the way from Argentina to breed in hayfields in our area. 8. The small white bell-shaped flowers of this shrub have pink stripes inside. 9. These two creatures are near look-alikes, with somewhat different patterns of large spots. 10. This colorful bird of old, shrubby fields is one of the ten most rapidly declining bird species in Massachusetts, probably due to habitat loss. 11. This large, sprawling native plant bears clusters of blue-black berries that feed many kinds of birds in the fall. 12. Common at bird feeders, this bird is native to the western US but spread rapidly in the east until its eastern populations suffered an epidemic of conjunctivitis that affected the birds’ eyes. 13. This animal wears a mask and prefers environments with water but also thrives near humans by stealing food from gardens, garbage cans, bird feeders, and compost piles. 14. These diving ducks are the last to stop over on Westborough’s ponds and lakes, just before the water ices over in December, and they pass through again when the ice melts in March.